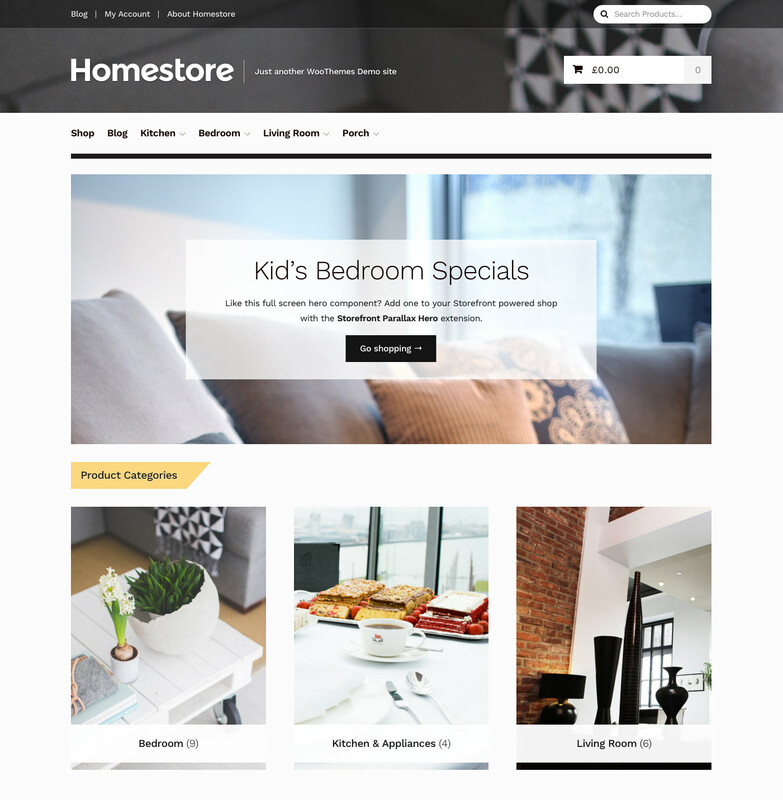 Homestore is a child theme for Storefront, the official WooCommerce theme. It provides an elegant and modern design with a magazine feel, which provides the right style for stores in the homeware industry. Homestore is a Storefront child theme, so you first need to install and set up Storefront and then Homestore afterwards. Download Homestore from your WooCommerce.com account at My Downloads. Repeat steps 3-5 for the Homestore theme from step 2. More information at: Installing & Configuring Storefront documentation and Installing a Theme. Once installation is complete and the key is activated for Homestore, it’s time to configure and set up your theme. Homestore adds a new menu location titled ‘Homepage’. This allows you to create a custom menu to be displayed alongside the homepage content. To get the menu to display, assign a custom menu to the ‘Homepage’ menu location. Note: We do not supply the exact images you see in our Homestore demo due to copyright restrictions. The WooCommerce Dummy Data instead comes with our own unique unrestricted images that we can redistribute within product import data. To display the Homepage menu, you need to assign a custom menu to the ‘Homepage’ menu location. By default, the Homepage menu is not displayed, it only shows up if there is a custom menu assigned to that menu location. The menu is managed in the same way as any other WordPress menu. You can read more about using WordPress Menus here. 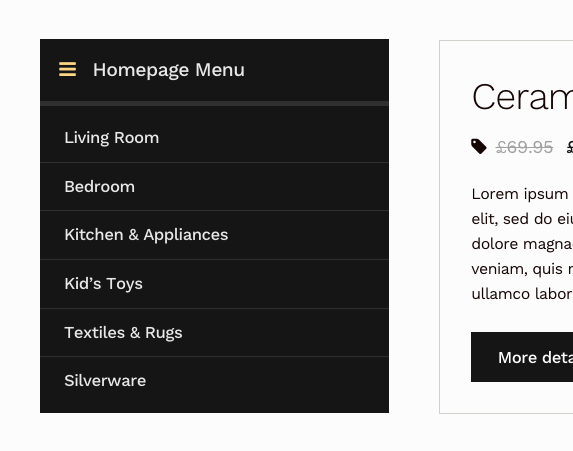 Homestore applies some specific styles to elements like buttons and the header layout, so these settings are removed from the designer to avoid confusion. Install the Homepage Control plugin. A lot of WordPress tutorials will recommend inserting code snippets into a child themes functions.php file. This is to ensure that you’re always able to update the parent theme without losing your changes. As Homestore is already a child theme, you aren’t able to do this. Any changes you add to Homestore’s functions.php file will be lost when you perform an update. Instead, it is recommended that you add any code snippets to a customization plugin. We’ve created a plugin you can use to do just this. Download Theme Customizations. How do I display the Homepage Menu? On the demo how do I change the order in which the different sections appear?